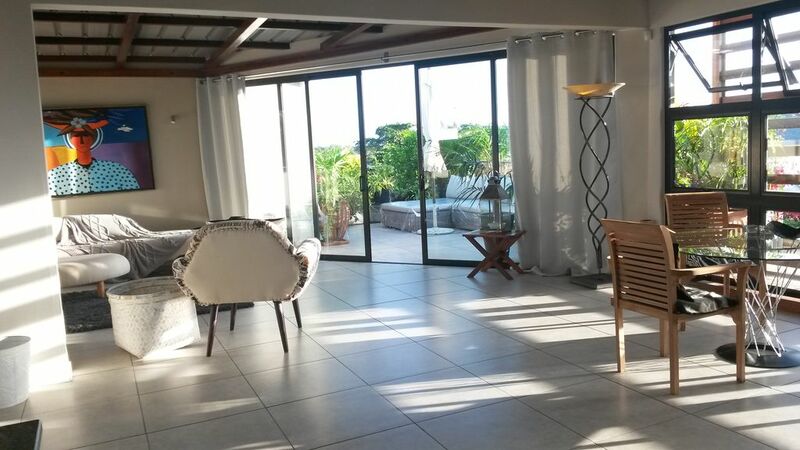 Very central and quiet, the apartment is located in a small cul de sac in the heart of Grand Baie ,, from where you can reach all amenities within walking distance .. The apartment is very private for togetherness as unreasonable located on all sides in the second floor with separate entrance. The former fishing village of Grand Baie has developed into a tourist focal point and offers a number of restaurants, bars, cafes and snacks, as well as shopping centers, supermarkets and many typical local area. Island tours and boat trips, water sports activities and you can book here. The German / Mauritian owners live in a part of the house with you and are happy to assist you with your planning and other Fragen..3x comes a weekly cleaning power. The boat trips are very popular with the landlord and get to know the sea and the offshore islands. The transfer, we can arrange for you. We really enjoyed our stay here. Hervè was attentive and helpful, he got us a big dorado from the warm Indian Ocean. And thank you. We must compliment on the design and style of your entire villa. We do have an appreciation of your design elements and difficulties involved to create a such pleasing environment both inside and outside. Had we known that it was going to be this lovely, we would have booked in for a longer stay. Next time. We also appreciate your attention to details of the excellent appliances and amenities. Due to an error in our booking days, we arrived in Mauritius one day too soon. Annette arranged for us to spend a night at her friend's guest apartment, thank you Annette and Maren. See you on our next trip to MRU. The apartment is located at the end of a quiet dead end, but only 2-3 minute walk from the heart of Grand Bay with its beach promenade, supermarket, banks, restaurants, bars .... and much more. Grand Bay itself is fascinating for its beautiful bay with all the boats, water sports and sightseeing opportunities.When you the ideal infrastructure.